The Euro declined as expected against the British Pound after prices produced a bearish Dark Cloud Cover candlestick pattern. Near-term support is at 0.7803, the 38.2% Fibonacci expansion, with break below that on a daily closing basis exposing the 0.7728-51 area marked by the July 2012 low and the 50% level. Alternatively, a turn above the 0.7873-96 zone (July 23 low, 23.6% Fib) opens the door for a challenge of the 14.6% expansion at 0.7953. While we are tempted to re-enter short after the second half of our EURGBP short position was closed last week, we will tactically opt remain flat for now.The upcoming publication of the Bank of England Quarterly Inflation Report may mark a pivotal moment for monetary policy bets, throwing off chart-based direction cues. With that in mind, we will stand aside for now. The Euro has launched a brisk recovery against the British Pound, rising to the highest level in a month. Near-term resistance is at 0.7947, the 61.8% Fibonacci retracement, with a break above that on a daily closing basis exposing the 76.4% level at 0.7985. Alternatively, a turn back below the 50% Fib at 0.7917 opens the door for a challenge of the 38.2% retracement at 0.7887. Prices are too close to resistance to justify entering long from a risk/reward perspective. On the other hand, the absence of a defined bearish reversal signal suggests that taking up the short side is premature. With that in mind we will remain flat for now. 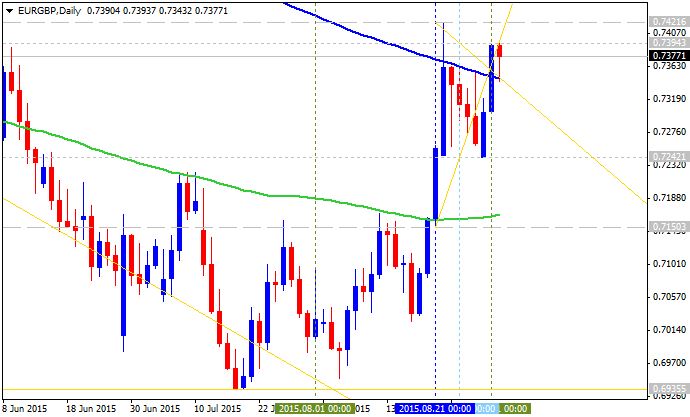 EUR/GBP Technical Analysis: Euro Bounce in the Cards? 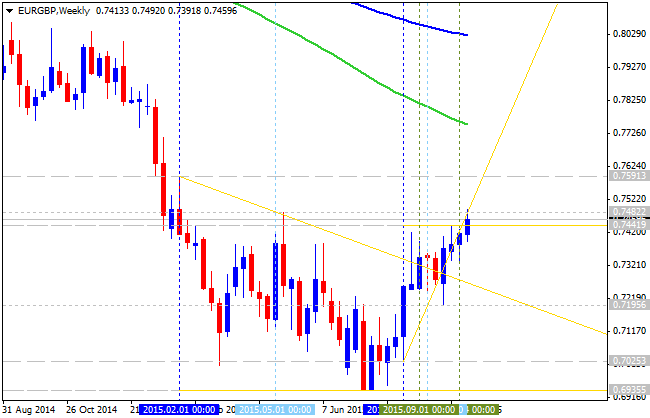 The Euro may rise against the British Pound following the appearance of a bullish Piercing Line candlestick pattern. A daily close above the 14.6% Fibonacci expansionat 0.7899 exposes support-turned-resistance at 0.7954. Alternatively, a turn below the 23.6% level at 0.7809 opens the door for a challenge of the 0.7751-65 area marked by the July 23 2012 and September 30 2014 lows. The Euro appears to be resuming its long-term down trend against the British Pound following the appearance of a bearish Three Inside Down candle pattern. Near-term support is at 0.7804, 23.6% Fibonacci expansion, with a break below that on a daily closing basis exposing the 0.7761-65 area marked by the 38.2% and the September 30 low. Alternatively, a reversal above 0.7856-69 area (Triangle floor, 38.2% Fib retracement) clears the way for a test of the 50% threshold at 0.7891. Prices are too close to support to justify entering short from a risk/reward perspective and we have established a pending order to sell the pair at 0.7839. 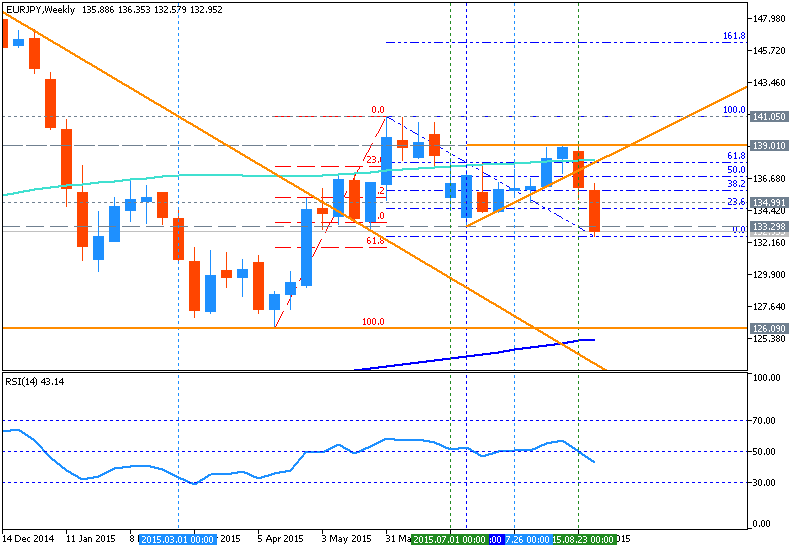 If triggered, the position will initially target 0.7804 with a stop-loss activated on a daily close above 0.7873. The Euro turned lower against the British Pound as expected after producing a Shooting Star candlestick below the 0.74 figure. A daily close below the 23.6% Fibonacci expansionat 0.7149 exposes 38.2% level at 0.7005. Alternatively, a move above the 14.6% Fib at 0.7239 opens the door for a test of the 0.7384-92 area (38.2% Fib retracement, March 25 high). We entered short EURGBP at 0.7311 and have since booked profit on half of the trade. The rest of the position will remain in play with a stop-loss at the breakeven level (0.7311) to capture any further downside momentum. The Euro continues to wait for directional guidance against the Japanese Yen as prices tread water above the 137.00 figure. Near-term support is at 137.51, the 23.6% Fibonacci retracement, with a break below that on a daily closing basis exposing the 38.2% level at 135.33. 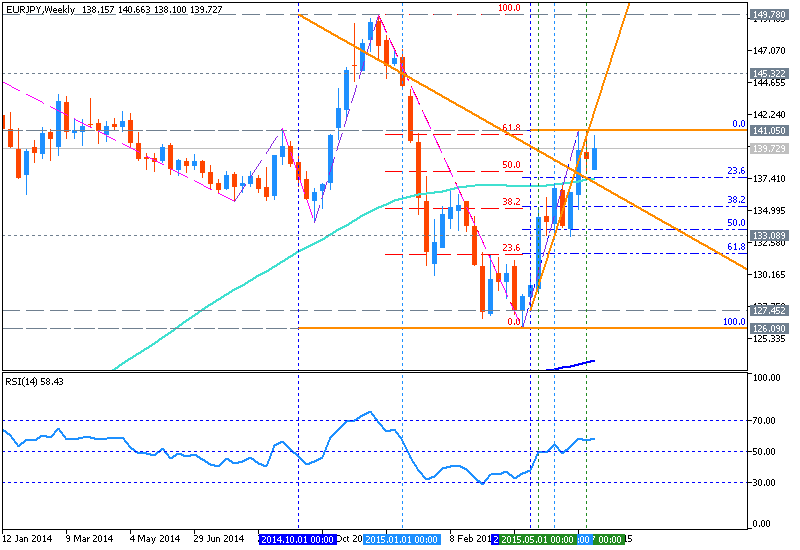 Alternatively, a move above the 14.6% Fib at 140.15 opens the door for a challenge of the 23.6% expansion at 141.50. The Euro is attempting to rebuild upside momentum against the British Pound after prices found support below the 0.73 figure. The single currency drifted downward having failed to hold up above the 0.74 mark but the return of risk aversion has proven supportive amid the unwinding of carry trades funded in terms of the low-yielding unit. Looking ahead, near-term resistance comes in at 0.7432, the 38.2% Fibonacci expansion. A break above this barrier on a daily closing basis exposes the 0.7482-90 area, marked by the June 5 high and the 50% level. Alternatively, a reversal back below the 23.6% Fib at 0.7361 clears the way for a retest of the 14.6% expansion at 0.7317. The long-term EURGBP trend has favored weakness since prices topped in December 2008. With that in mind, any near-term gains appear corrective and our preference is to stand aside while those moves play out, waiting for an actionable selling opportunity to emerge. The Euro came under renewed selling pressure against the Japanese Yen, dropping to the lowest level in over four months. The pair now finds itself at a pivotal juncture, with prices testing below support that has capped losses since early May. A daily close below the 133.07-30 area marked by the aforementioned horizontal pivot and the 76.4% Fibonacci expansion initially opens the door for a test of the 100% level at 131.24. 134.20 clears the way for a test of resistance-turned-support at 135.11, the 50% expansion. Risk/reward considerations argue against trying to chase the pair lower. A break below support remains inconclusive absent confirmation on a daily closing basis, with a swift reversal higher a discrete possibility if risk trends firm on the back of the upcoming US jobs report. With that in mind, we will continue to stand aside and wait for a more compelling opportunity to present itself. The Euro resumed its recovery against the British Pound, rising to probe the highest level in eight months. Prices are now challenging resistance below the 0.75 figure that has kept the single currency capped against Sterling since early May. Near-term resistance is at 0.7482, the May 7 high, with a break above that on a daily closing basis opens the door for a challenge the 38.2% Fibonacci expansion at 0.7529. Alternatively, a move back below double-top resistance-turned-support at 0.7421clears the way for a test of 0.7333, the intersection of rising trend line support and the October 7 low. Prices are too close to justify entering long from a risk/reward perspective. Furthermore, the long-term trend continues to favor the downside, suggesting the upswing since July is corrective. With that in mind, we will continue to stand aside and wait for a confirmed bearish reversal signal to trigger a short position. Intraday bias in EUR/GBP is back on the downside with the current fall. Focus is now on 0.7195 support. Decisive break there will confirm that whole rebound from 0.6935 has completed at 0.7492 already after failing to sustain above 0.7482 resistance. In that case, deeper fall should be seen back to 0.6935 low.